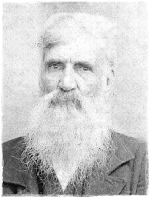 Emsley Thomas Wallace, son of Isham Wallace and Nancy Furr, married Priscilla Melton (1834-1909),daughter of James Melton and Temperance Horner. The Wallaces and the Meltons were close neighbors and there were four marriages between the families; Emsley and three of his brothers went on to marry four of James Melton’s daughters. Emsley and Priscilla lived just southeast of the town of Robbins at the end of the present day Rushwood Road. Like many of his time, Emsley spent the majority of his life farming the 230 acres of land he owned near Buffalo Creek. Baxter was the son of Noah Williams and Mary Ann Davis. Elizabeth was the daughter of Emsley Wallace and Priscilla Melton.